Water Tanks With Low Profile 10-Degree Roof – Water Storage Tanks, Inc. Low-profile roofs are available for CorGal Tanks integrated into projects where the overall tank height is critical or for those projects whose owners prefer a less visible tank roof. The low-profile-roof tank is not a standard model. 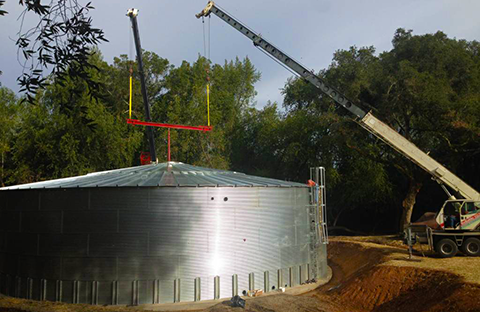 Each tank requiring a low-profile roof is custom designed for a specific site and purpose. Low-profile roofs are better suited to locations without heavy snow loads. However, low-profile-roof CorGal Tanks can be supplied with an interior center roof support pole and/ or reinforcing roof panel ribs for added support where larger roof loads are present. Center support structures also enable low-profile roofs to be available for large diameter tanks. 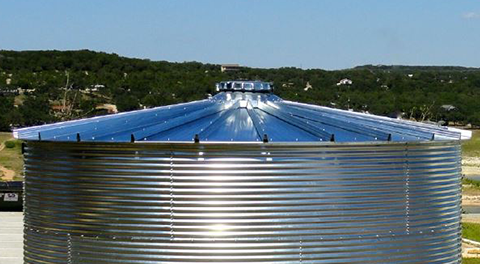 Looking for a larger diameter water storage tank with a low profile roof? All capacities are rounded. Actual tank capacities will vary due to location of flanges and structural design.